AAA Southern States Refinishing will refinish your existing bathtub and tile to a like-new appearance in a matter of hours, not days for much less. We are proud to be a Hawk Research Labs GlassTech9000 installer. Bathtub refinishing at its best. Why use Glasstech 9000? click here. Unlike plastic bathtub liners, our liquid applied liner (Glass Tech 9000) contours to every curve of your bathtub. Bathtub liners are expensive and time consuming. 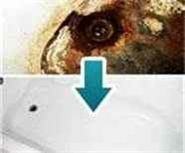 Our bathtub refinishing process will last many years at typically half the price of a plastic bath liner. Bathtub liners are not recommended by hotel and apartment facilities due to cost and longevity of the bath liner. The most common problem associated with bathtub liners is the lack of bond on curves and bottom of the bathtub causing cracks and splits on or near the bottom. Our bathtub refinishing process covers and repairs even the most damaged surfaces including chips, holes, cracks and rust stains. Whether you have a cracked bathtub, bathtub repair or your tub has dulled, refinishing it will beautify your old bathtub for many years. It also makes your tub easier to clean by closing the pores left by harsh cleaners. Our tile refinishing process will completely seal in old, discolored grout leaving you a non porous, easy-to-clean new surface. All of our tile refinishing projects will receive new caulk at all joints for a complete watertight seal. AAA Southern States Refinishing will always disclose the materials we use in refinishing and repairing our customers’ bathtubs. We also ensure that our materials are properly labeled. We’re proud of our process and more than willing to discuss our procedures with you at anytime. For instruction sheet about how to care for your newly-refinished bathtub or tile, click here.